The United Filipino Darts Club (UFDC) of Abu Dhabi strikes back with a BIG bang as they celebrate the 111th Philippine Independence with an astounding P100,000 dart tournament dubbed as ‘P100,000 Philippine Independence Day Cup 2009.’ This tournament has been made possible through the able leadership of Ding Arduo, who has never grown tired of leading the club for nearly three (3) years now despite his hectic work schedules and no nonsense ridicules from his bitter dart critics. UFDC takes great pride with the support and approval of the Philippine Embassy in Abu Dhabi through Hon. Consul General Noel Servigon, who will also grace the event as the Guest Speaker. This P100,000 ranking event is sanctioned and supported by the NDFP and is open to all nationalities within the UAE and the nearby GCC region. It will be held on Friday, May 29, 2009 at Arkadia International located at Marina Area, Tourist Club, Abu Dhabi, UAE. Registration starts at 12:00NN and the game time will be at 2:00PM. 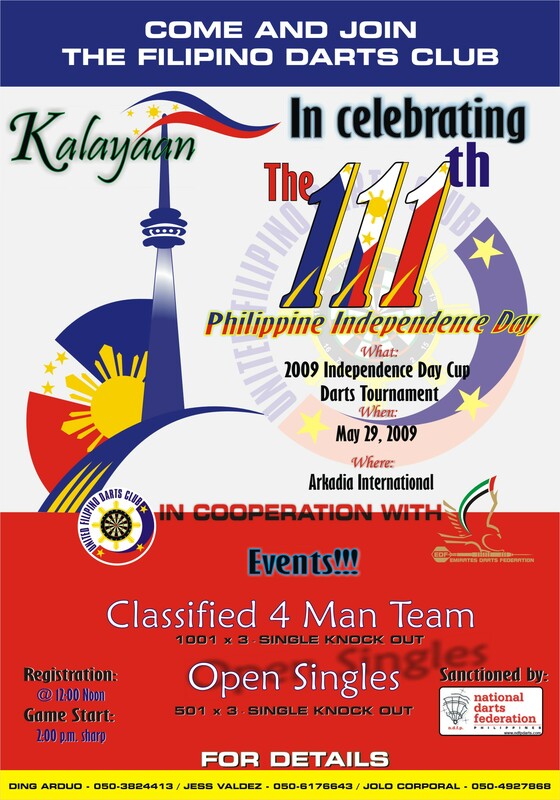 The event will include the following: 4-Person Team Competition -- 1001 best of 3 and Open Singles – 501 best of 3. Both events will be on a single knock-out game format. Entry fee will be AED 80.00 with one (1) free drink of choice. President Ding Arduo wishes to extend his warmest gratitude to the following UFDC officers and members for their unconditional support in organizing this tournament: Jolo Corporal, Doc Allan Federiso, Ryan Delos Reyes, Orlan Bernardino, Mhyreen Corporal, Alex Dacay and Jess Valdez. Likewise, UFDC extends its special appreciation to NDFP Secretary General Ronnel Botor for his incessant support and inspiration to UFDC and its projects.